The aim of the research was to examine the effects of the number of categories for polytomous items on psychometric properties in a nonparametric item response theory (NIRT) model. For the purpose of the study, data sets with two different sample sizes (100 and 500) that come from different sample distribution shapes (normal distribution, positively skewed distribution, and negatively skewed distribution), two different test lengths (10 items and 30 items), and three different number of categories (three, five, and seven) were generated. The effects of the number of categories on psychometric properties of polytomous items were analyzed by Mokken Homogeneity Model (MHM) under NIRT model. The research was designed as a basic research. In the generation and analysis of data sets, R Studio 3.4.0 software was used. For analysis conducted with MHM, Mokken package was used in R Studio. According to scaling with MHM, specific pattern of item fit to MHM with changing the number of categories was not observed. In general, it was found that the number of categories has no effect on reliability estimate. It was determined that tests have weak fit to MHM under test conditions in the research. Araştırmanın amacı çok kategorili puanlanan maddelerden oluşan testlerde kategori sayısının psikometrik özellikler üzerindeki etkisinin parametrik olmayan madde tepki kuramı (POMTK) modeli ile belirlenmesidir. Belirlenen amaç doğrultusunda iki farklı büyüklükte (100 ve 500), çeşitli dağılım özelliklerine sahip (normal dağılan, sağa çarpık dağılan ve sola çarpık dağılan) örneklemler için iki farklı test uzunluğunda (10 madde ve 30 madde), üç farklı sayıda kategoriye (üç, beş ve yedi) sahip maddeler simülatif olarak üretilmiştir. Kategori sayısının psikometrik özellikler üzerindeki etkisi POMTK modellerinden Mokken Homojenlik Modeli (MHM) ile araştırılmıştır. Yapılan araştırma temel araştırma olarak tasarlanmıştır. Verilerin üretilmesinde ve verilerin analizinde R Studio 3.4.0 yazılımı kullanılmıştır. R Studio yazılımında MHM’ye göre analizler Mokken paketi ile yapılmıştır. MHM’ye göre yapılan ölçekleme sonucunda kategori sayısının değişmesiyle birlikte maddelerin MHM’ye uyumunda belli bir örüntü gözlenmemiştir. Genel olarak hem kısa testlerde, hem de uzun testlerde kategori sayısının güvenirlik değerlerinin kestiriminde etkili olmadıkları gözlenmiştir. Araştırmada belirlenen test koşullarında testler MHM’ye düşük düzeyde uyumlu çıkmıştır. Crocker, L. & Algina, J. (1986). Introduction to Classical and Modern Test Theory. Orlando: Harcourt Brace Jovanovich Inc.
DeMars, C. E. (2002, April). Recovery of graded response and partial credit parameters in multilog and parscale. Paper presented at the annual meeting of American Educational Research Association, Chicago. Erkuş, A., Sanlı, N., Bağlı, M., & Güven, K. (2000). Öğretmenliğe ilişkin tutum ölçeği geliştirilmesi. Eğitim ve Bilim, 25(116). http://egitimvebilim.ted.org.tr/index.php/EB/article/view/5276/1439 adresinden erişildi. Hambleton, R. K., & Jones, R. W. (1993). Comparison of classical test theory and item response theory and their applications to test development. Educational Measurement, 12, 38-47. Hemker, B. T., Sijtsma, K., Molenaar, I. W., & Junker, B. W. (1996). Polytomous irt models and monotone likelihood ratio of the total score. Psychometrika, 61(4), 679-693. İlhan, M., & Güler, N. (2017). The number of response categories and the reverse directional item problem in likert-type scales: a study with the rasch model. Eğitimde ve Psikolojide Ölçme ve Değerlendirme Dergisi, 8(3), 321-343. Koğar H., (2015). Madde tepki kuramına ait parametrelerin ve model uyumlarının karşılaştırılması: bir monte carlo çalışması. Eğitimde ve Psikolojide Ölçme ve Değerlendirme Dergisi, 6, 142-157. Lee, J., & Paek, I. (2014). In search of the optimal number of response categories in a rating scale. Journal of Psychoeducational Assessment, 32(7), 663-673. Leung, S. O. (2011). A comparison of psychometric properties and normality in 4-, 5-, 6-, and 11-point likert scales. Journal of Social Service Research, 37(4), 412-421. Lozano, L. M., García-Cueto, E., & Muñiz, J. (2008). Effect of the number of response categories on the reliability and validity of rating scales. Methodology: European Journal of Research Methods for the Behavioral and Social Sciences, 4(2), 73-79. Maydeu-Olivares, A., Kramp, U., García-Forero, C., Gallardo-Pujol, D., & Coffman, D. (2009). The effect of varying the number of response alternatives in rating scales: experimental evidence from intra-individual effects. Behavior Research Methods, 41(2), 295-308. Meijer, R. R. (2004, March). Investigating the quality of items in cat using nonparametric irt. Law School Admission Council Computerized Testing Report. A Publication of the Law School Admission Council. Mokken, R. J. (1971). A theory and procedure of scale analysis: with applications in political research. The Hague: Mouton. Mokken, R. J. (1997). Nonparametric models for dichotomous responses. In W. J. van der Linden, and R. K. Hambleton (Eds. ), Handbook of modern item response theory (pp. 351-368). New York: Springer-Verlag. Preston, C. C., & Colman, A. M. (2000). Optimal number of response categories in rating scales: reliability, validity, discriminating power, and respondent preferences. Acta Psychologica, 104(1), 1-15. Ramsay, J. O. (1991). Kernel smoothing approaches to nonparametric item characteristic curve estimation. Psychometrika, 56(4), 611-630. Sijtsma, K. & Molenaar, W. I. (2002). Introduction to Nonparametric Item Response Theory, USA: Sage Publications. Sijtsma, K., Debets, P., & Molenaar, W. I. (1990). Mokken scale analysis for polychotomous items: theory, a computer program and an empirical application. Quality and Quantity, Kluwer academic publishers, Netherlands. Štochl, J. (2007). Nonparametric extension of item response theory models and its usefulness for assessment of dimensionality of motor tests. Acta Universitatis Carolinae, 42(1), 75-94.
van der Ark, L. A. (2007). Mokken scale analysis in r. Journal of Statistical Software, 20(11), 1-19. Weng, L. J. (2004). Impact of the number of response categories and anchor labels on coefficient alpha and test-retest reliability. 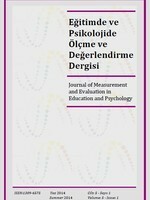 Educational and Psychological Measurement, 64(6), 956-972.